As the raging Big Cottonwood River rose last week, so did the anxiety level of the people of Springfield; and when the river reached its crest and began to slowly recede, the people of Springfield breathed a sigh of relief. The U.S. National Weather Service on Friday, predicted the river to rise to near 30.0 feet above Springfield by Monday evening, March 25, and then begin falling. (The readings are taken above Springfield with hydrology tools located on County Road 2 west of town.) The Big Cottonwood River reaches flood stage in Springfield at 22.0 feet. At 8:30 a.m. Friday, March 22, the stage was 28.7 feet. The river crested at 29.41 feet at 4:15 a.m. Saturday, March 23. That was good news for Springfield. The flood water that overflowed the banks of the Big Cottonwood River into Riverside Park did not reach the swimming pool. The flood water did not reach the Springfield Golf Course club house. From pictures taken by a drone flown over the golf course Sunday, it appears that the water came within a half foot short of the patio on the south side of the club house, according to club house manager Jen Schultz. It was fortunate that we had perfect weather for the heavy snowpack — thawing during daytime and freezing temperatures overnight to slow the process. 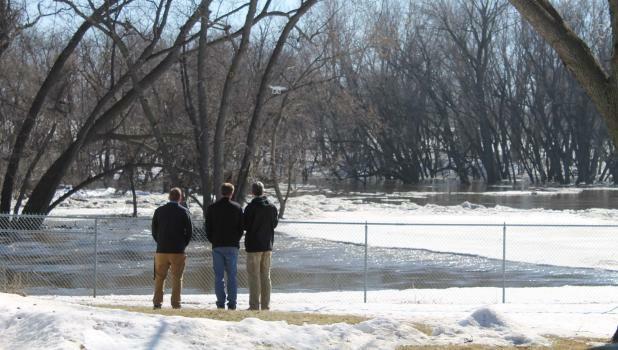 Springfield was, however, as ready as possible when the water began to flow over the road by the Springfield Golf Course and into Riverside Park Thursday, March 21. And, no one is complaining about all of the work required to mitigate flood damage to structures, equipment and supplies in the park and at the golf course. Earlier forecast for flooding were for severe flooding. Public Works employees had worked the previous week to prepare for flooding. The removed a gazebo, picnic tables, equipment from concession stands, closed valves at various stations, removed pumps from the swimming pool, and they tied down playground equipment so that it wouldn’t be carried away by raging water from an overflowing Big Cottonwood River. Having had much experience dealing with flooding — including four floods last year — they worked at it steadily They know by watermarks on structures, a blob of paint on a pole, or the rung of a split rail fence at what point the water will flow over the campground, the playground, the ball fields, and into the swimming pool in Riverside Park. Public Works employees maintained pumping operations in the area of Washington Avenue and Lincoln Street. Runoff water from Highway 14, Marshall Avenue, Jefferson and Jackson Streets flows into that basin area. When the river reaches a level when water can no longer drain into the river it is pumped over the levee to prevent flooding in the east part of town. The one thing that made it more difficult to address flooding this spring were ice jams. They’re unpredictable, they’re tough to address and they can have significant impacts.